What Day Of The Week Is October 25? 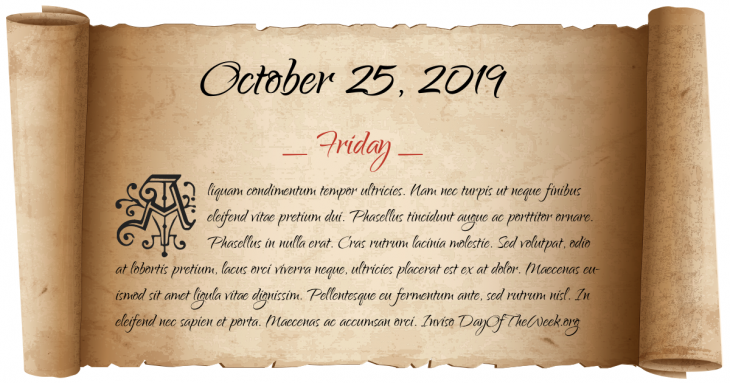 October 25, 2019 is the 298th day of the year 2019 in the Gregorian calendar. There are 67 days remaining until the end of the year. The day of the week is Friday. The Battle of Balaklava during the Crimean War (Charge of the Light Brigade). After 74 days on Hunger Strike in Brixton Prison, England, the Sinn Féin Lord Mayor of Cork, Terence MacSwiney died. Battle of Leyte Gulf, the largest naval battle in history, takes place in and around the Philippines between the Imperial Japanese Navy and the U.S. Third and U.S. Seventh Fleets. The Republic of China takes over administration of Taiwan following Japan’s surrender to the Allies. Operation Urgent Fury: The United States and its Caribbean allies invade Grenada, six days after Prime Minister Maurice Bishop and several of his supporters are executed in a coup d'état. Fidel Castro, Cuba’s President, announces that transactions using the American Dollar will be banned. Who were born on October 25?